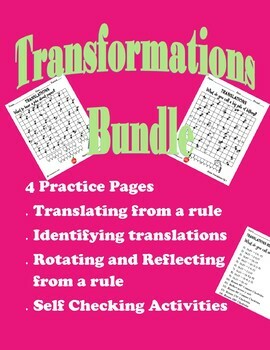 this bundle has 4 separate worksheets that are used to practice. Students will identify translations and match them to algebraic representations. They will translate points, reflect and rotate points according to algebraic representations and verbal descriptions. This is a self checking activity in that the riddle will not make sense if it is not done correctly. It is good practice for translating points on a coordinate grid. If you like this activity please follow me and visit my store for more fun activities.